Like much of the country it was a cool, crisp start to the day this morning. But the sun was shining, which is always helpful when visiting different places on a field trip. This morning we met up again with Dr Kate Pedley at the Kaikōura museum. This was where we had our first field trip web conference. We used a room that has been set up to show various things related to the earthquake. You can get an idea of what the room looks like from one of the panorama pictures at the top of this diary page. Our speaking school this morning was Waipahihi. There were also quite a few listening schools. It was a great session. You can listen to a recording of the web conference by clicking on the link in the web conferences timetable. Hopefully you can join us for the next live one. After the web conference we went with Kate to Gooch’s Beach. This part of the coastline was lifted about a metre in the earthquake. What was interesting here were the round, spherical rocks the size of beach balls that we could see. Kate explained that the earthquake had exposed the rocks. She also said they were concretions. A concretion is a compact mass of mineral matter that had embedded in a host rock. You can see one of these concretions in a photo from today on the right of this page. You’ll also see that the ambassadors were impressed by it! Kate explains more about how concretions are formed in one of today’s videos. From Gooch’s Beach we made our way to Takahanga Marae. Here we were formally welcomed by tangata whenua from Te Rūnanga o Kaikōura. After the pōwhiri, we had a cup of tea and a chat with our hosts. It was amazing to hear how the earthquake had uncovered ancient artefacts. The artefacts have revealed further insights into their ancestors’ way of life that has been part of the area for over 1,000 years. The marae became a key area of refuge immediately after the earthquake. It catered for a huge number of locals and visitors who suddenly found themselves without shelter, food, or water. Watch the video and you’ll get a better understanding of the generosity and community spirit shown by Te Rūnanga o Kaikōura during this time of urgent need. We said ka kite to our hosts and drove north to Paparoa Point. 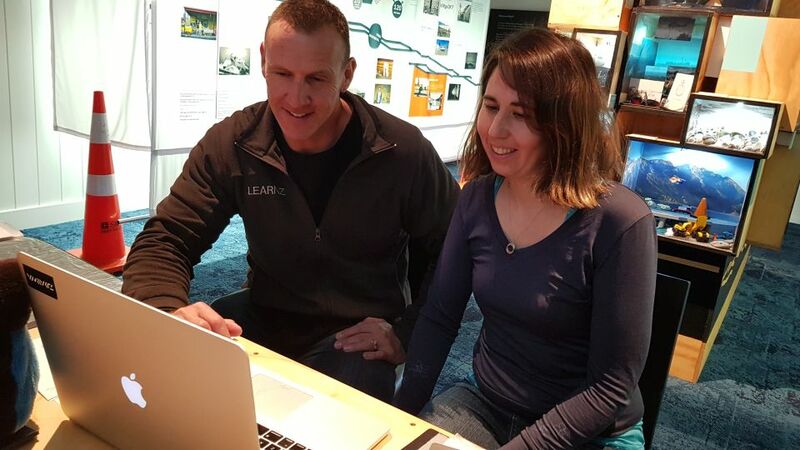 Here we met Te Korowai representative and commercial paua diver Jason Ruawai. You can read more about the role of Te Korowai on the background page Guardianship of the Changing Waters. Map showing the drive from Kaikōura to Paparoa Point. 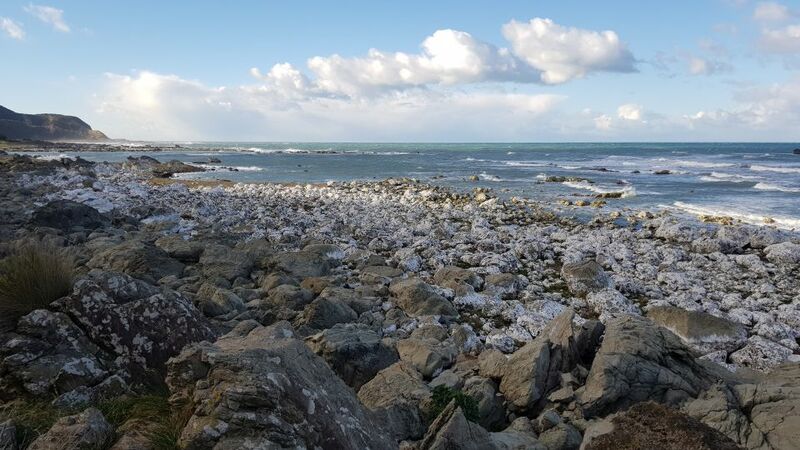 The first thing you notice at Paparoa Point is a whole lot of white rocks. The white is dead coraline pink algae. And it is dead because this part of the coastline rose five metres during the earthquake. The sad thing is that thousands of shellfish like pāua died, leaving the likes of Jason out of a job. Much of the Kaikōura coastline is now a no-take area for pāua until their numbers grow again. When that will be is uncertain. The good news is that a reseeding effort is taking place. At this location alone, up to 80,000 young paua have been placed into the new tidal area. I guess it’s only fair that people give mother nature a bit of a helping hand from time to time. After all, she’s been providing people in the area with food for hundreds of years. I’m looking forward to another interesting day in Kaikōura tomorrow. Andrew with Kate Pedley on this morning's web conference. Image: LEARNZ. 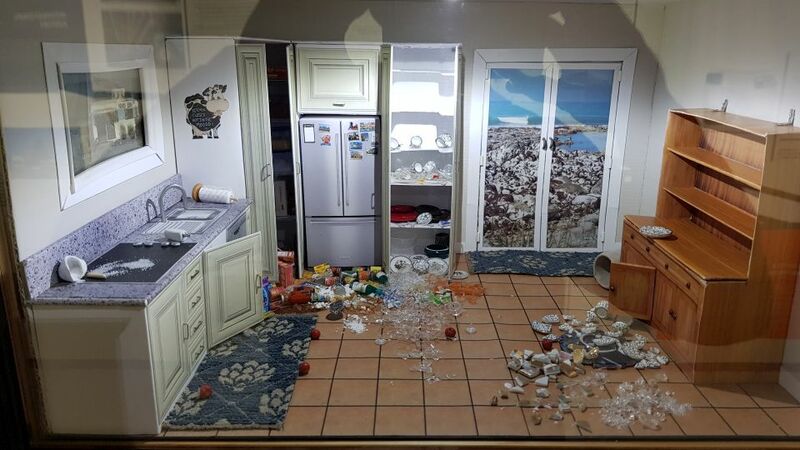 A diorama showing a scene from the November 2016 earthquake on display at the Kaikōura museum. Image: LEARNZ. Exposed rocks from one metre uplift at Gooch's Beach. Image: LEARNZ. 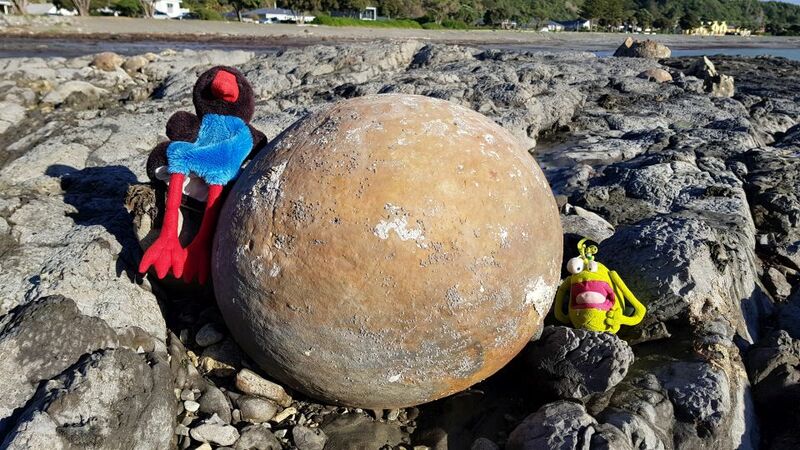 The ambassadors were impressed with these round rocks found at Gooch's Beach after the earthquake. What are these round rocks called? Image: LEARNZ. 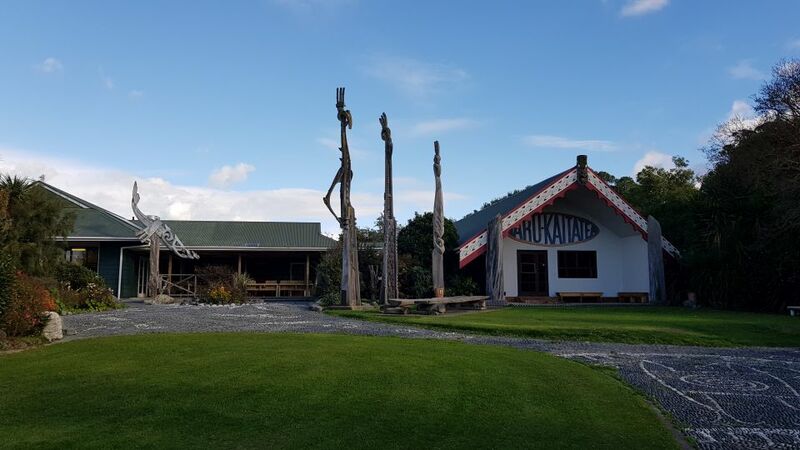 A view of the wharenui at Takahanga Marae. How was the marae helpful after the earthquake? Image: LEARNZ. 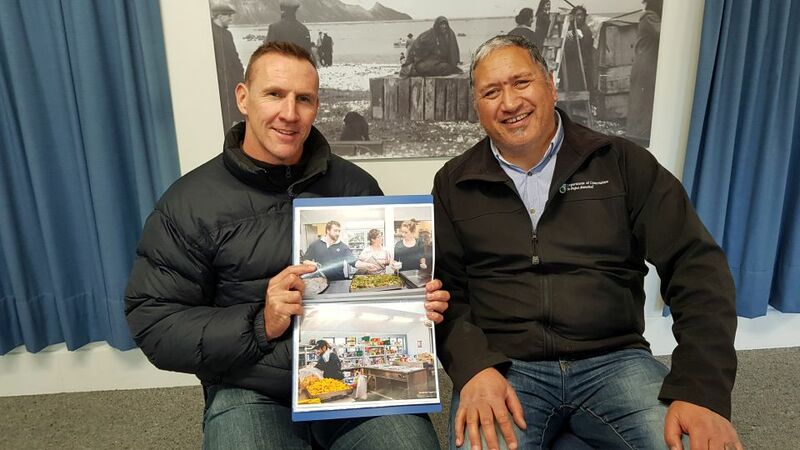 Andrew with Brett Cowen at Takahanga Marae. 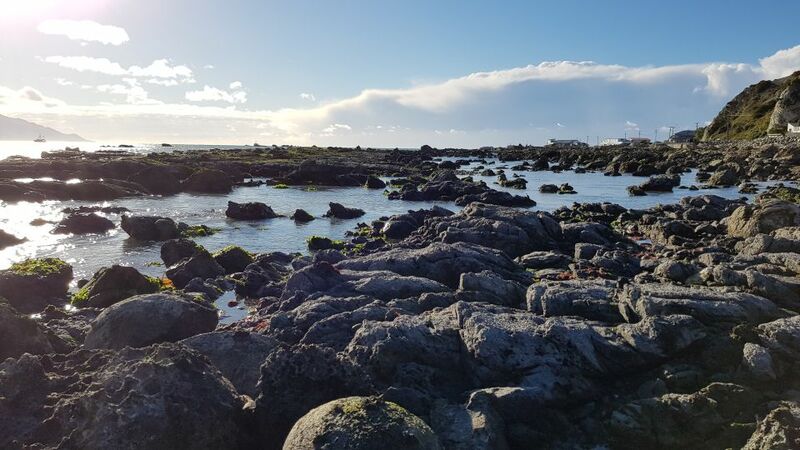 What has been found since the earthquake that has helped connect Kaikōura iwi to their ancestors? Image: LEARNZ. 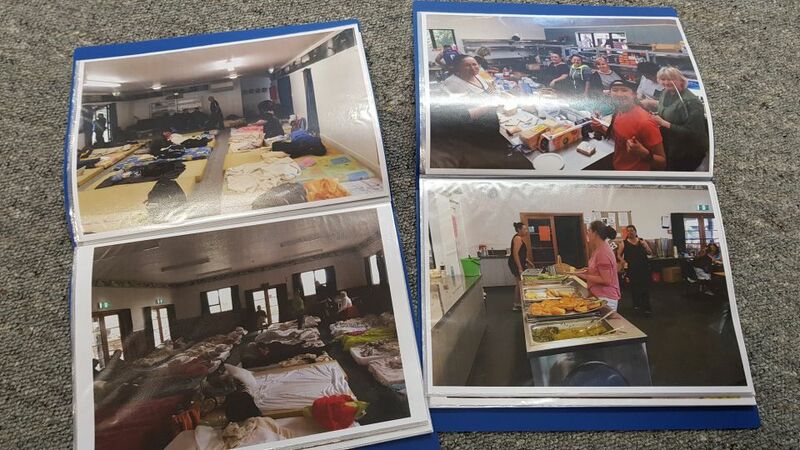 Some of the many images Brett showed us that give you an idea of the massive effort imvolved in creating a refuge for locals and visitors in need of supplies and shelter immediately after the earthquake struck. Image: LEARNZ. 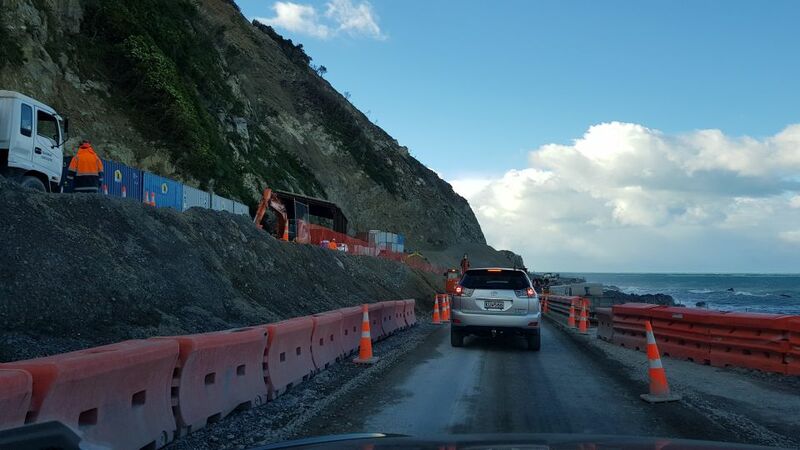 Ongoing roadworks along State Highway 1 heading north to Paparoa Point. Can you see the slip on the left? Image: LEARNZ. Andrew with Te Korowai representative Jason Ruawai. 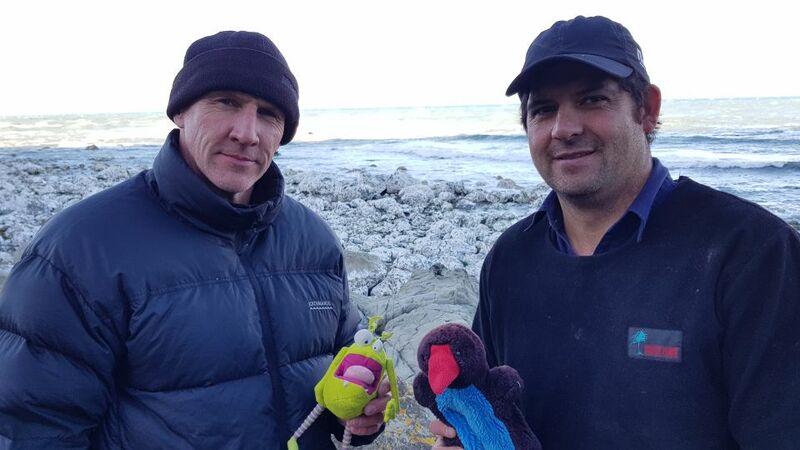 How is Te Korowai helping the Kaikōura marine ecosystem after the earthquake? Image: LEARNZ. This area of coastline at Paparoa Point has been uplifted by five metres. How has this uplift affected shellfish? Why are the rocks white? Image: LEARNZ.